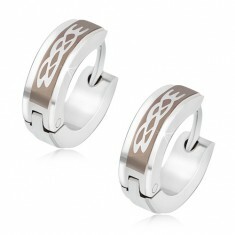 Your favorite product: Steel earrings, rings with tribal an ornament, a raised center strip of S50.23 - is added to the wish list. Circular earrings made of surgical steel, steel grey belt with printing ornament, the reduced margins. 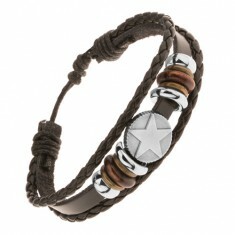 Your favorite product: Bracelet made of brown synthetic leather and steel ovals, stars Y41.20 - is added to the wish list. 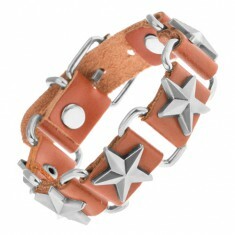 Brown bracelet with an adjustable length of the artificial leather and steel, steel-gray five-pointed star. 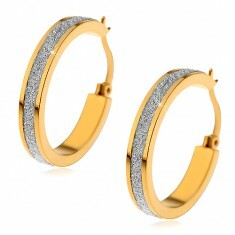 Your favorite product: Gold earrings steel Love Kiss M9.29 - is added to the wish list. Your favorite product: Earrings made of surgical steel gold color with a shimmering sandblasted stripe X03.10 - is added to the wish list. Circular stud earrings, in the middle of with a rough shimmering stripe of dark gray color, surgical steel. Your favorite product: Earrings made of surgical steel yellow smiley face with piercings S11.13 - is added to the wish list. 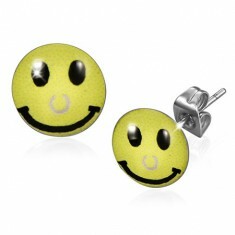 Round steel earrings, yellow smiley face with grey circular body piercing instead of a nose, glaze, puzetky. Your favorite product: Bracelet of entangled beige cords, steel-gray beaded flowers S16.25 - is added to the wish list. Densely zaplétaný bracelet made of beige motouzků, shiny beads steel-gray color, the flowers. Your favorite product: Circular earrings made of surgical steel silver color, three gray stars V15.10 - is added to the wish list. 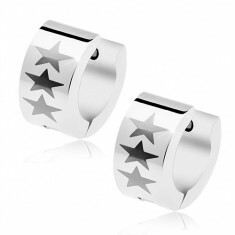 Articulated earrings made of steel 316L in silver shade, smooth shiny surface, three five-pointed stars. Your favorite product: Earrings made of steel 316L, shiny furrow, three belts in gold, silver and copper color AC09.27 - is added to the wish list. 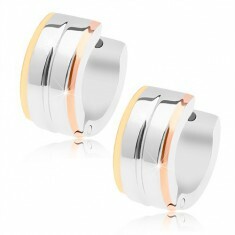 Steel earrings in a shiny gray hue, the center strip in silver and side stripes in gold and zlatorůžové color. Your favorite product: Multináramek of artificial leather, steel, and wooden beads, maltese cross Y44.07 - is added to the wish list. 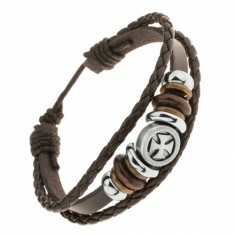 The bracelet on the hand - also dark brown leather belt with threaded beads of metal and wood, the maltese cross in a circle of steel-gray color. 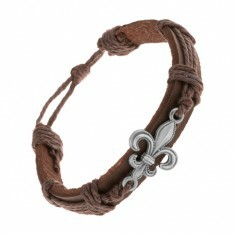 Your favorite product: Leather bracelet dark brown color, patinated steel symbol of the Fleur de Lis Z17.06 - is added to the wish list. The bracelet on the hand - also dark brown belt synthetic leather, the carved symbol of the royal lilies of steel-gray color, patina. 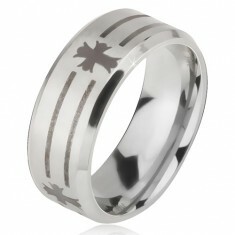 Your favorite product: Ring of steel - is added to the wish list. Ring of surgical steel with a recurring motif of the dark elephant around the entire circumference of the ring. 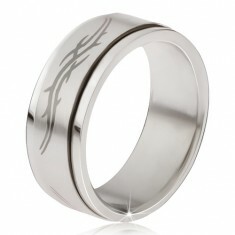 Your favorite product: Matte steel ring - is added to the wish list. Ring surgical steel silver color, beveled edges, grey print of crosses and stripes. 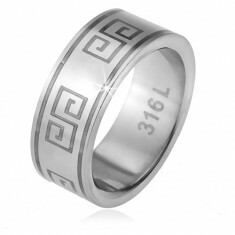 Your favorite product: Ring made of steel 316L, matt finish, the pattern of the Greek key BB13.19 - is added to the wish list. 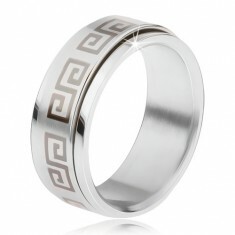 Matte steel ring silver color, gray motif of the Greek key between two lines. Your favorite product: Steel ring, spinning matte hoop Greek key grey color BB17.18 - is added to the wish list. 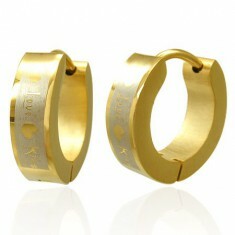 A shiny ring made of surgical steel, matte the spinning hoop, the pattern of the Greek key.